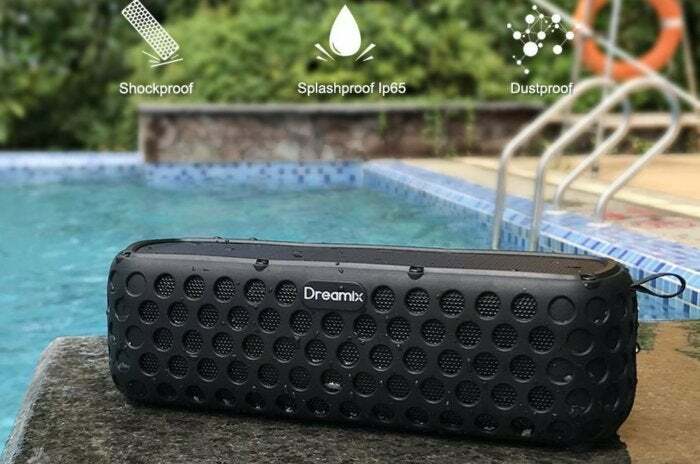 Amazon is selling a splashproof Dreamix portable Bluetooth speaker for 40 percent off its usual price. A portable Bluetooth speaker can be a convenient way to tune into music wherever life takes you, and today’s deal can keep your jams rocking even by the pool. Right now, you can get a Dreamix portable Bluetooth speaker for $25.19 on Amazon, which is almost 40 percent off its average price. This speaker allows you to connect your device wirelessly via Bluetooth, obviously. It claims to have more than 30 hours of play time on one charge, which can be supplemented with its built-in solar panel, and an integrated microphone allows calls as well as listening. The Dreamix speaker also comes fitted with a protective silicone rubber cover that helps it “withstand an accidental drop in water.” The Anker SoundCore A3102, our favorite budget Bluetooth speaker, costs a similar $27 on Amazon but isn’t weatherized and can’t be used for calls. While we haven’t tried the Dreamix speaker ourselves, it has a solid 4.3 out of 5 stars on Amazon with over 200 user reviews. It’s also fulfilled by Amazon, which means you can rest easy knowing you’ll be able to get assistance from Amazon’s customer service if you have any issues.